The history of war and combat is filled with stories of men (and women) snatching victory from the jaws of defeat. Impossible circumstances, unfavorable odds, somehow they still lead to almost miraculous triumphs. What I set out to do with my latest book was study the traits that make this possible and how they can be applied to life, across disciplines. “The impediment to action advances action. A parade of military legends followed his example—Frederick the Great, George Washington, Ulysses S. Grant, Theodore Roosevelt, Dwight D. Eisenhower, and James Stockdale. Not to mention the countless (and nameless) brave men and women who served with and after them. They all figured out how to turn obstacles upside down—how to turn what was in the path, into the path. What follows are three examples of how to follow this formula in our own lives, to turn any and every obstacle we face into opportunity. During the Civil War, Union troops were unloading a steamboat near Union headquarters outside Richmond when it suddenly exploded. Everyone hit the dirt as debris and shells and even bodies rained down—everyone but Ulysses S. Grant who, as the leader of the Union forces, was seen running toward the scene of the explosion. Grant’s nerve is an example of someone who has steadied himself with grace and poise to persevere through the trial that was the Civil War. We can learn from Grant. His choice—and make no mistake, it was a choice—to run toward the chaos was just one of many similar instances over the course of the greatest trial in American history in which he steadied himself with grace and poise in order to persevere. In our normal daily lives things are going to happen that catch us off guard—surprises are almost guaranteed. Regardless of how much actual danger we’re in, stress puts us at the mercy of our baser, fearful instincts for self-preservation. This prevents us from acting with what the English call a “cool head,” or even acting at all. Talent is not what is needed here. It is grace and poise, for they are the two attributes that give us the opportunity to reliably deploy any other skill in our arsenal. Like Grant, we can refuse to be intimidated, and use our steady calm to act boldly and overcome the obstacles that inevitably come our way. There is almost no situation in which a strong nerve does not help. When United States Navy fighter pilot James Stockdale was captured by the North Vietnamese in 1965, he knew (even as his parachute was deploying) that he would be the highest-ranking Navy POW they had ever taken prisoner. He knew he couldn’t do anything about his fate, but as a commanding officer he knew he could provide leadership and support and direction for his fellow prisoners (who included future senator John McCain). Stockdale made this his cause, and he acted with it at the forefront of his mind for the next seven years; two of which were spent wearing leg irons in solitary confinement. There are times when we feel helpless, as if there is nothing we can do for ourselves because of the obstacles we face, like the world is against us. That may be true, but when we choose to focus on others—by providing assistance or being a good example—our own personal fears and troubles inevitably diminish. Stockdale gave his fellow POWs a mantra: Unity over Self. Put that in the forefront of your mind. When it comes to obstacles we face in life and the reactions they provoke—boredom, hatred, frustration, or confusion—we have the power to submit to a greater, larger cause in our most difficult times. To wrest an opportunity from the difficult circumstances we find ourselves in. Like Stockdale, by thinking how we can make it better for other people—wherever we happen to be working, whatever we happen to be doing—we can create a mission for ourselves and get unstuck. Instead of flinching, Eisenhower searched and found the opportunity inside the obstacle rather than allow himself to become overwhelmed by the obstacle that had threatened the Allied forces for years. What Eisenhower discovered was that the Blitzkrieg strategy left their flanks exposed. This allowed the Allied forces to attack from the sides and encircle the enemy from the rear. This is a textbook example of the role our own perceptions play in the success or failure of those that oppose us. Whether it’s a boss we dislike or a friend that has wronged us, we have the ability to push aside our preconceptions and look for the opportunity in the trials that come our way. When someone is causing problems for you—they are likely also offering you up opportunities. It’s all a matter of how you’re looking at the situation. Eisenhower recognized that the Allied lines were getting demolished by the Blitzkrieg. Well, what if we let them through? A-ha! And thus opportunity was born. It’s an important skill we can all develop, to mentally flip our obstacles on their head and find the opportunity within them. Where is your A-ha! moment? Late in his reign, sick and possibly near death, Marcus Aurelius received some surprising news. His friend and most trusted general, Avidius Cassius, had rebelled against him. Instead of getting angry or taking it personally, he turned his friend’s betrayal into an opportunity to promote peace and practice forgiveness. He wouldn’t kill Cassius for his treachery, but would instead capture him and forgive him, “to continue to be faithful to the one who has broken faith.” He would use it as an opportunity to teach the Roman people and the emperors who came after him. The obstacle became the way. As you can see, there is a pattern in these examples. A terrifying obstacle stood in the way of each of these great men, but they didn’t flinch or get intimidated. As soldiers, they had no choice. They leaned into the problem and gave it everything they had. It is an art we can bring to our own lives, in business, and in relationships, turning our obstacles into the way. This post originally appeared on RangerUp.com. Comments can be seen there. For more on Stoicism visit The Daily Stoic. I promise I’m not writing this because I have a deadline. Or, well, I actually kind of am. See, I’ve found that my output depends almost entirely on my level of commitments (either internal or external). Consider it kind of a reverse Parkinson’s Law. Parkinson’s Law states that a task will take exactly the amount of time you have budgeted. In this version, I posit that: You will write, produce, do, and turn in more if you have regular, standing commitments that you’d feel bad about breaking. This is something we can recreate in our own life. We can make big commitments to produce work — commitments that might seem beyond our limits — and use our desperation as a fuel to power their fulfillment. The question is: why would you make commitments that stretch your capabilities in the first place? Well that ties into the second thing I have learned. Quantity increases quality. With creative work, we can get bogged down with perfection — endlessly tinkering and improving, but only as an excuse to delay publishing. Steve Jobs, on the other hand, was notorious for demanding perfect products but also backing the projects against hard ship-dates. In other words, he put his engineers on a Death Ground and they had to fight for their survival — accomplishing more than they thought possible in the process. We can and should tap into that with our own work, whatever we happen to do. On my blog, where I can publish as much or as little as I like — I barely squeeze out a post a month. I never feel inspired, I never feel like I have time, I make a million excuses. For Thought Catalog, where I’m asked to contribute one article per week, I almost always hit my mark (and end up with ideas I never would have written otherwise). If I sell a book proposal, I’m going to find time to work on the book — even if I had otherwise felt that my schedule was booked. If I put a writing project on my to do list and schedule the time, I’m going to get a lot more done than if I just waited for inspiration to strike. These external deadlines remove the resistance that may otherwise prevent me from getting stuff done. At the end of the day, to get good at what you do you have to put thousands and thousands of hours in. But those thousands of hours can’t all happen hidden in your cave like Demosthenes (the Athenian Orator who shaved half his head so he’d be too embarassed to do anything but practice alone). Ultimately, putting your work out — in front of people — is how you grow the most. You get feedback, you develop an intuition for the audience, you learn about your own tastes and preferences. Nobody tells this to people who are beginners, I wish someone told me. All of us who do creative work, we get into it because we have good taste. But there is this gap. For the first couple years you make stuff, it’s just not that good. It’s trying to be good, it has potential, but it’s not. But your taste, the thing that got you into the game, is still killer. And your taste is why your work disappoints you. A lot of people never get past this phase, they quit. Most people I know who do interesting, creative work went through years of this. We know our work doesn’t have this special thing that we want it to have. We all go through this. And if you are just starting out or you are still in this phase, you gotta know its normal and the most important thing you can do is do a lot of work. Put yourself on a deadline so that every week you will finish one story. It is only by going through a volume of work that you will close that gap, and your work will be as good as your ambitions. And I took longer to figure out how to do this than anyone I’ve ever met. It’s gonna take awhile. It’s normal to take a while. You’ve just gotta fight your way through. The same goes for marketing and consulting work: If I sell a certain amount of time or a set of a services, I’ll make it work. If I am just sitting here, thinking about how much time I have for stuff, I feel like I’ll never get it all in. I actually prefer to have someone sell my services for me on commission, because they’ll always push harder than I will. And I will get better and grow in my struggle to meet all those demands. The point is: our limits are often illusionary. Slovenian cyclist Jure Robic, who may been the world’s greatest endurance athlete, is proof of this. He was also “insane,” which may have contributed to his ability to train 335 days a year in addition to his races. According to The New York Times, researchers in the 1800s began noticing a link between mental disorders and greater-than-ordinary athletic feats. The German surgeon August Bier once found the long jump of a mentally ill patient measured up near the then-current world record. In the years since, scientists have found links that show that fatigue is at least partially controlled by the brain and central nervous system — and that our actual physical capabilities stretch beyond this. This is all to say — that resistance you’re feeling? Part of it is just in your head. We have to put ourselves in a position to challenge it. We have to create situations which force us to do more and more and more to see what we’re really capable of. The result is that we’ll improve with each attempt, and like Ira Glass explained, our output will begin to approach our demanding tastes over time. You can be good at more than one thing. Or you can get really good and master one thing. But either way, the path is clear: lots and lots of work. Think quantity before you give yourself the cop out that “quality” often is. It’s something I’ve learned over and over again. The more deadlines I set for myself–both internal and external, the more I’m able to produce. It’s the best way I’ve found to prevent lame excuses like “lack of inspiration” or “lack of time” from creeping in. So give yourself some deadlines or force others to set them for you, and when you feel the resistance coming on, think of what Jure would do and sign yourself up for more than you think the body is even capable of taking. This column originally appeared on Thought Catalog. Comments can be seen there. It recently occurred to me that there is one person I don’t feature in The Obstacle Is The Way but easily could have. Because like Rockefeller, Edison, Earhart, and especially Theodore Roosevelt, there is a man who proves and has lived the message pretty clearly: Arnold. 1965: Arnold served in the Austrian army to fulfill his one year service requirement. He ends up going AWOL during basic training so he can compete in the Junior Mr. Europe contest and ends up serving a week in military prison because of it. He won the contest. 1968: Arnold arrives in America with little money and can barely speak English. Because bodybuilding doesn’t pay, he begins a bricklaying business with a fellow bodybuilder, mixing cement and knocking down walls with a sledgehammer. 1970: Arnold won his first Mr. Olympia title at 23, making him the youngest Mr. Olympia ever, a record he still holds today. He would go on to win it six more times. 1971: Arnold’s brother Meinhard died in a car accident in which he was killed instantly. Arnold would later pay for Meinhard’s son Patrick’s education and his emigration to the United States. 1972: Arnold’s father, Gustav Schwarzenegger, dies from a stroke. Arnold was unable to attend his funeral because he training for a bodybuilding content. 1980: Arnold was a color commentator at the 1980 Mr. Olympia competition when he announced at the last minute he would compete in the contest. Schwarzenegger had been retired from competition but had been secretly training for the event. He won it with only seven weeks of preparation and after being declared Mr. Olympia for the seventh time he officially retired from competition. 1984: Arnold appears in James Cameron’s The Terminator. Of his early acting career, Arnold said, “It was very difficult for me in the beginning – I was told by agents and casting people that my body was ‘too weird’, that I had a funny accent, and that my name was too long. You name it, and they told me I had to change it. Basically, everywhere I turned, I was told that I had no chance.” Basically, Arnold turned all those ‘negatives’ into a totally unique and iconic package. 1991: Arnold reappeared as the title character in Terminator 2: Judgment Day, which was the highest-grossing film of 1991. 1993: Arnold stars in Last Action Hero, which did poorly at the box office, opening opposite Jurassic Park. It is one of many failed movies in his career–as he admits. 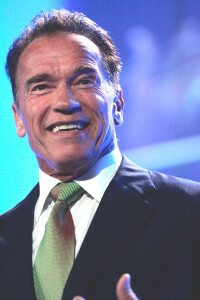 1994: Arnold’s movie career bounces back when he reunited with James Cameron for the popular sky film True Lies. 2001: Arnold broke six ribs and was hospitalized for four days after a motorcycle crash in Los Angeles. 2006: Arnold wins re-election for Governor of California by well over one million votes. 2009: He gives an epic and philosophic commencement address to USC students. 2013: Arnold restarts his acting career with his first leading role in 10 years with The Last Stand, and his first co-starring role with Sylvester Stallone in Escape Plan. Also cooly embraces reddit and social media to great results. What Arnold shares with all the figures in the The Obstacle Is The Way is that stoic idea of self-direction, self-discipline, self-mastery. He faced innumerable problems and obstacles in his life—some of which he created for himself, as we know—but what mattered more than that was how he responded. He saw, as Marcus Aurelius wrote, that the impediment to action can advance action. He saw that the obstacle is the way.